Summary: The Mosedale Horseshoe is one of the most exciting day long walks in the Lake District. 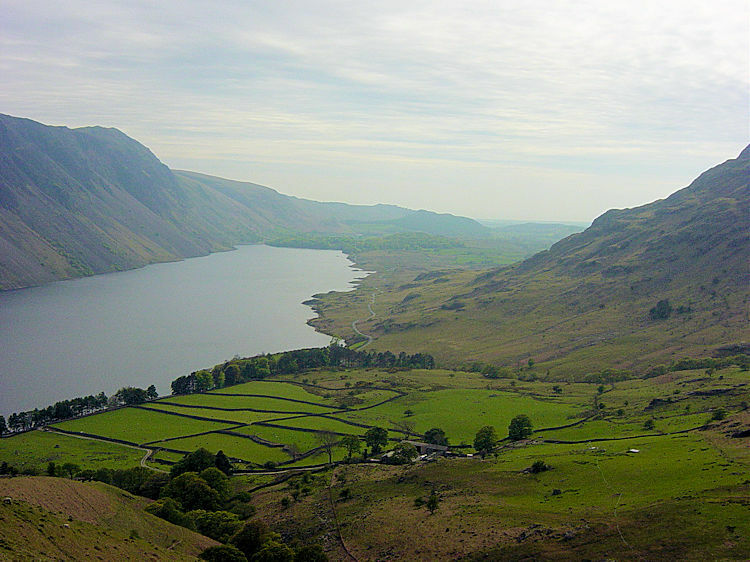 It is essentially a circular which begins on the northern banks of Wast Water. 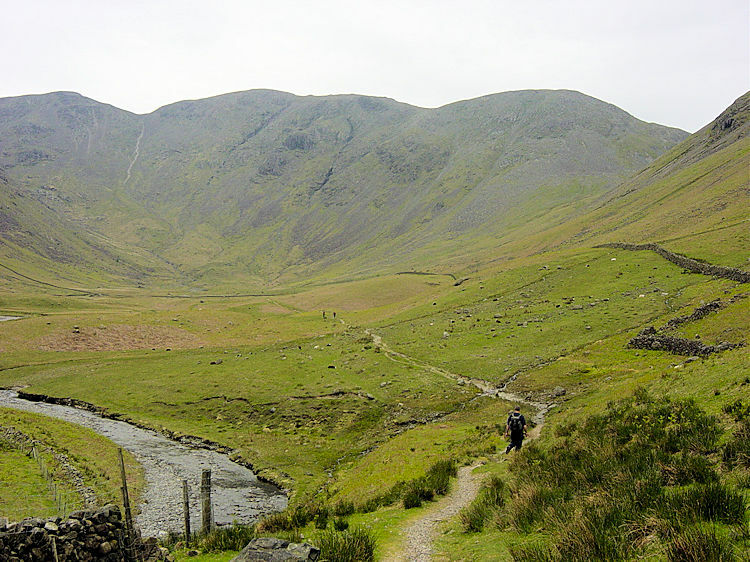 From this lowest point the walk climbs steadily through Wasdale into Mosedale and then follows Black Sail Pass onto the Pillar ridge at Looking Stead. 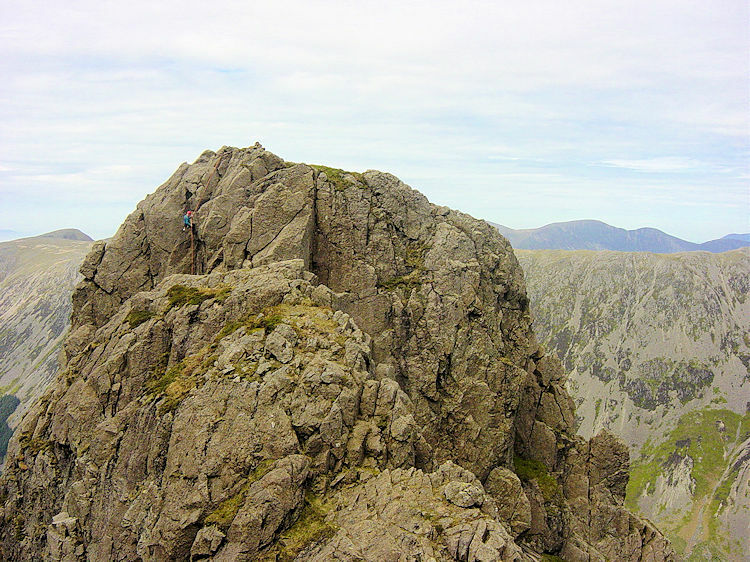 Here the first alternative is taken by following the ridge onto Pillar or dropping onto the High Level Route to Robinson's Cairn and Pillar Rock before climbing steeply to the summit. 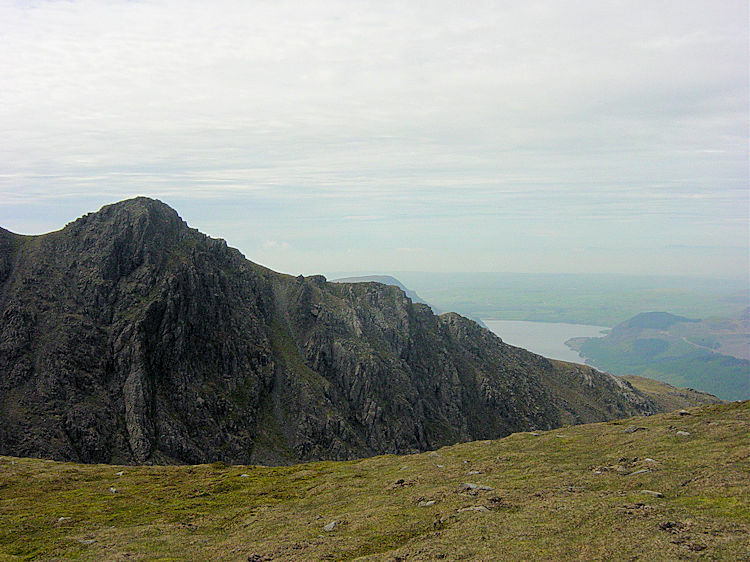 After Pillar the walk involves a ridge crossing (with brilliant views) to Scoat Fell and then on to Red Pike before descending to Dore Head and the edge of Yewbarrow. Here the second alternative awaits. 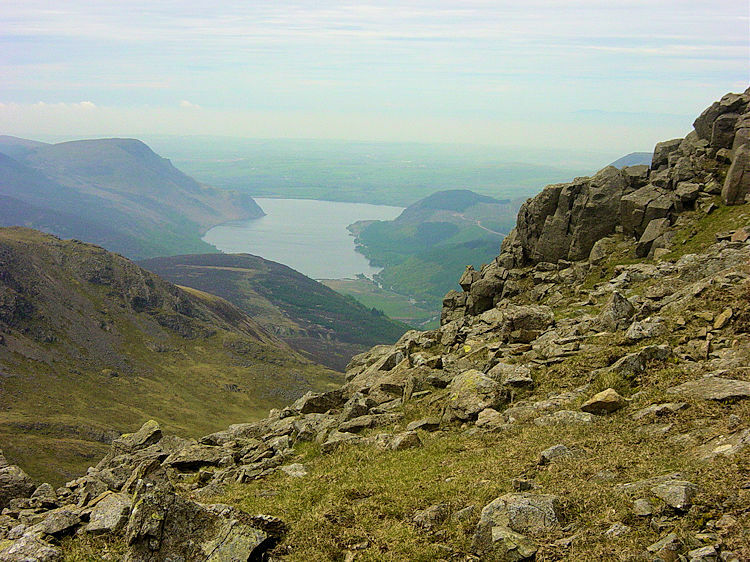 If feeling good then climb and scramble Stirrup Crag onto Yewbarrow. If a little fatigued then simply follow the contour path alongside Over Beck before making a final short steep descent back to the car park to conclude this fantastic walk. The Walk: There are sometimes unforgettable moments when a car drive around a corner to the start of a walk is just a potent a memory as the walk itself. 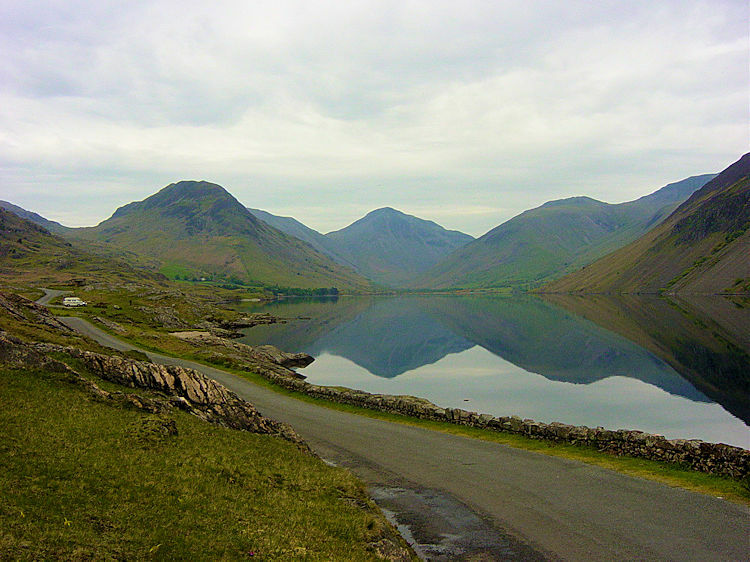 The drive around the mound of High Birkhow near Wasdale Hall where Wast Water is reached is one such moment. Suddenly an inconsequential drive becomes something much more - a gobsmacking moment for any discerning walker. As Wast Water opens out in front of ones eyes it reveals its glorious companions which includes Scafell, the greatest of English Mountains. 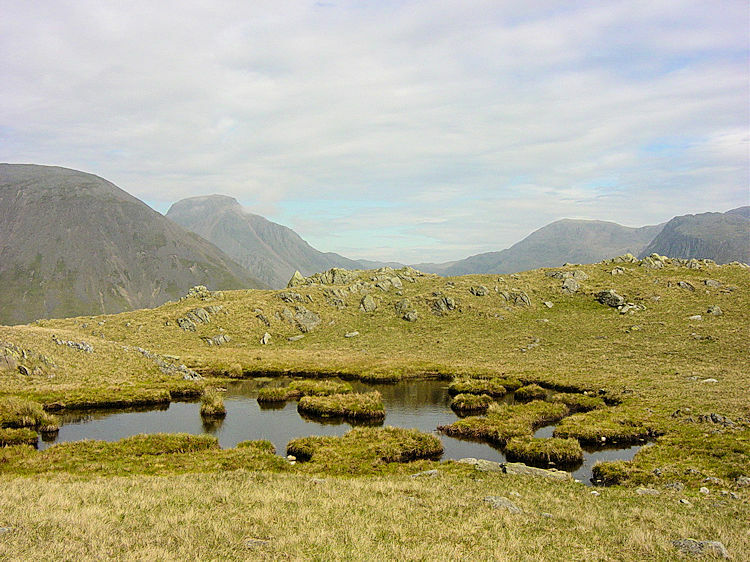 Further inspection also exposes Great Gable, Lingmell, Great End and even Scafell Pike, the highest of them all. This place is an incredible feast for the walking enthusiasts eyes and on reaching this place my day was already satisfied. Even before my walk! Yet of all the heights I could see there was only one in my walk plans this day. Humble Yewbarrow, famed by walkers and walkers alone on the northern edge of Wast Water was the last target of the epic Mosedale Horseshoe. I had done it once before in the company of my brother Dave. This time I was in party with my other walking pal Steve. Unlike the first time when I stayed on the Pillar ridge this time I intended to visit the famous rock. Here follows the story of our incredible walk. We parked at Overdale Bridge immediately upsetting a couple who wanted plenty of space between their car and any other. You know them, the type who will make 10 spaces into nine by crossing the line. The eyes we got from them for our impudence of parking next to them in the only space available were devilish. Pardon me! Despite changing into our boots next to them no pleasantries were passed between us. No matter, I quickly forget about them as we moved off on our walk along the road on the northern shores of Wast Water toward Wasdale Head. It was about 10.00am and overcast but so still. The conditions were such that there was not the faintest ripple in England's deepest lake so I took some pictures of the perfect reflection given by the motionless water. With both water and air being still the quiet in the valley was eerie, only broken by our chatter, the gentle running of Mosedale Beck, the spring calls of Lakelands early birds and the sheep and lambs. After we passed the pub at Wasdale Head the steady walk ended and the climbing began, gently at first around the flanks of Kirk Fell. Soon the gentle climbing around the western face of Kirk Fell got progressively harder, especially after the gentle walk beside Mosedale Beck was ended when Gatherstone Head was reached. We were now on Black Sail Pass and on the longest climb of the day, crossing over Gatherstone Beck during the relentless climb to the saddle of the pass. During the climb Steve had got ahead (he is the better climber) while I cast clothing and took pictures so I decided to climb up Murl Rigg. 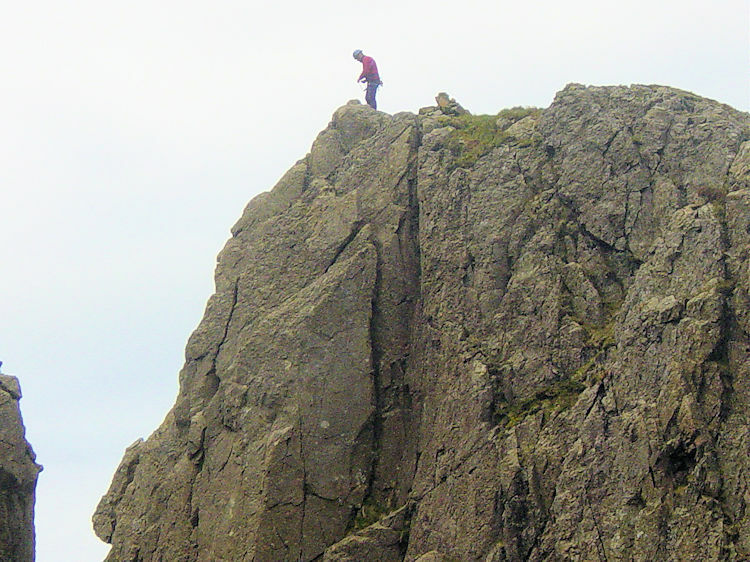 It was a tough steep climb but great fun and (GASP..) eventually I reached the summit ridge at Looking Stead. Once on the crest of Black Sail Pass I rejoined Steve and we walked together to Looking Stead. 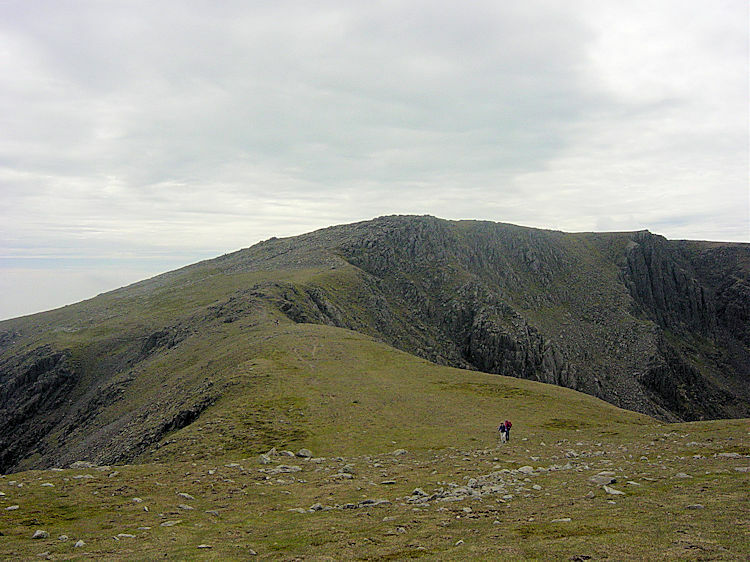 He had followed the path to the top of Black Sail Pass and then turned left (north west) to follow the ridge. We now had a choice, to stay on the ridge or to follow a path down the ironically named High Level Route (what is more high level than the ridge?). We walked on a little trying to find the path down but I could not find it. My GPS confirmed I had passed it so with Steve staying on the ridge and continuing on to Pillar summit I decided to drop straight down from the ridge to the path which I could see about 150 metres below. Steve later concluded I must have missed the path from the ridge by making the Murl Rigg climb. Nevertheless I was not going to miss Pillar Rock for a second time and so while Steve stayed high down I went. The descent was steep indeed and on reflection I should have walked back to where the path left the ridge but I was now committed to my actions. Although I could see the whole way down and although 95 percent of the drop was straightforward the other five percent had to be done on my backside as I slid about 6 feet down a slab getting my backside wet for my efforts. Despite the discomfort I was now down on the path I needed to be, the High Level Route. 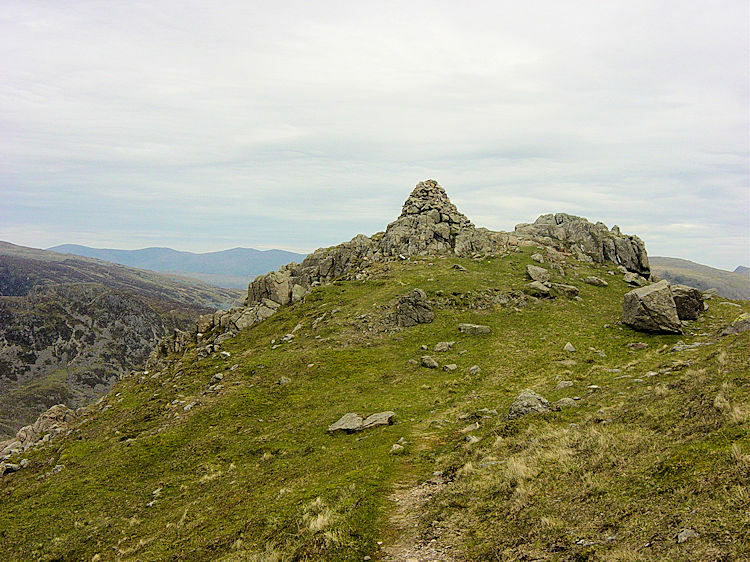 After walking on the route for a short distance I reached Robinson's Cairn. 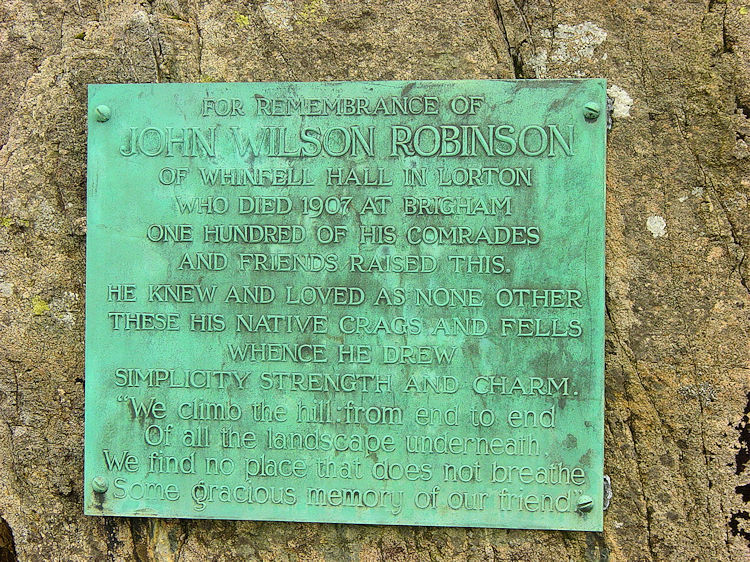 The cairn is in the memory of John Wilson Robinson (died 1907) and was erected by 100 of his friends and colleagues - he must have been a remarkable guy. The cairn sits in a beautiful place on the shoulder of Pillar with excellent views of Ennerdale below and the High Stile range of hills to the north. Take a moment out to take in the beauty of this place for there is a more dramatic spectacle waiting around the corner. After leaving Robinson's Cairn the High Level Route took me around a corner from where I caught my first close up sight of Pillar Rock. It was a marvellous moment and I stood in awe at the rock projecting large and gloriously out of the northern face of the mountainside. The scene was even more dramatic than I had expected for between me and Pillar Rock was a large open gully which I had to cross. The path was clear to see as it first descended then climbed over scree and all during the crossing with the clear view down of the drop into Ennerdale I thought of how this was a perfect spot for gliding birds of prey. Although exposed I was never too worried for the path was clear to follow and this section, appropriately named the Shamrock Traverse (lucky to be here!) was a special place to walk. As I was completing the crossing of the open section I noticed a couple of climbers on Pillar Rock. Even though I was so close to the rock they still looked like tiny toy soldiers. I was not going to enlarge them by getting any closer though and remained on the path as it cut up grooves and over ledges near to the southern base of the rock. I took in my last close views of Pillar Rock before making my climb steeply off the northern face of the mountain. The last 30 metres was more akin to a scramble where hands had to be used throughout. I had been quite a while on my tour of the northern face of Pillar. My intentional tardiness on the traverse had caused Steve to move off and enjoy the rest of the walk on his own. I would do the same and after a brief stoppage at the summit for refreshments I moved off the great mountain in the direction of Little Scoat Fell by passing Wind Gap, Black Crag and Mirk Cove. 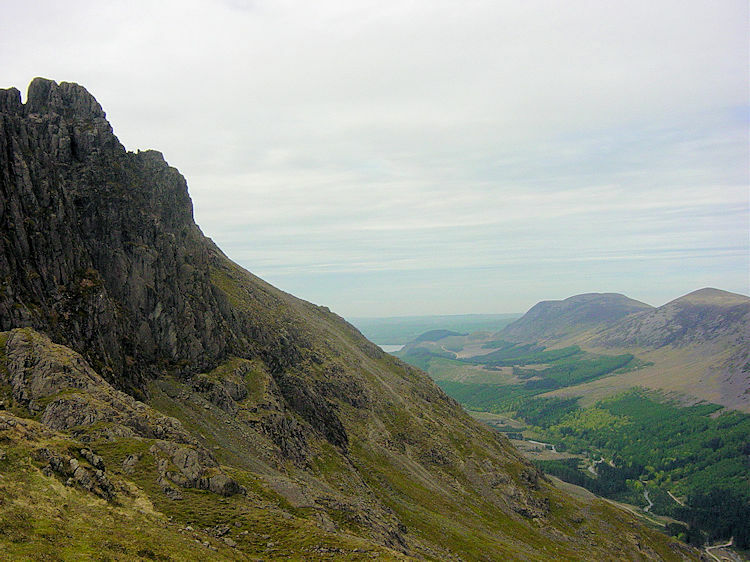 Steeple enticed me, jutting out towards Ennerdale but I had not the time to climb it. Banked for another day. The weather had improved during my day on the Mosedale Horseshoe though. Little wind and no mirk at all during my enjoyment on Pillar. The views I was being provided with were excellent and so it continued as I made my crossing of the majestic ridge section between Little Scoat Fell and Red Pike. As I roved along the ridge towards Red Pike I gazed down to my right at Scoat Tarn and beyond it Low Tarn. Next in my line of sight was Yewbarrow. Last time I had climbed it while Dave stayed below. This time I had taken more energy out of myself by dropping down to Pillar Rock. As I walked along the ridge and even as I reached Red Pike I was still unsure of my intentions. 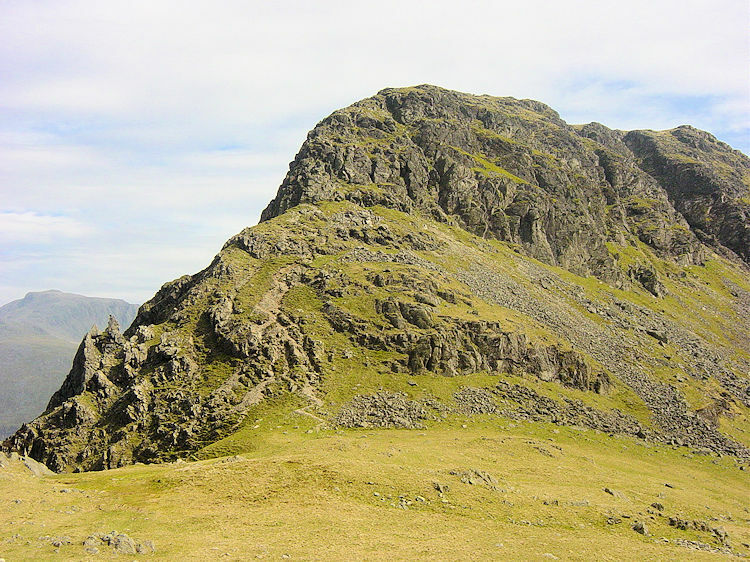 The climb onto Yewbarrow via Stirrup Crag is superb but was I up to it today? And considering the likelihood of Steve being back at base camp now, should I? After Red Pike I walked on to yet another Black Crag and stopped for my final refreshment break. It was during the final break that I finally decided to give Yewbarrow a wide berth this time. I could have done it but the walk had been the hardest I had done so far this year and we had four more full days to go, all of equal intensity, so caution was the best way forward. 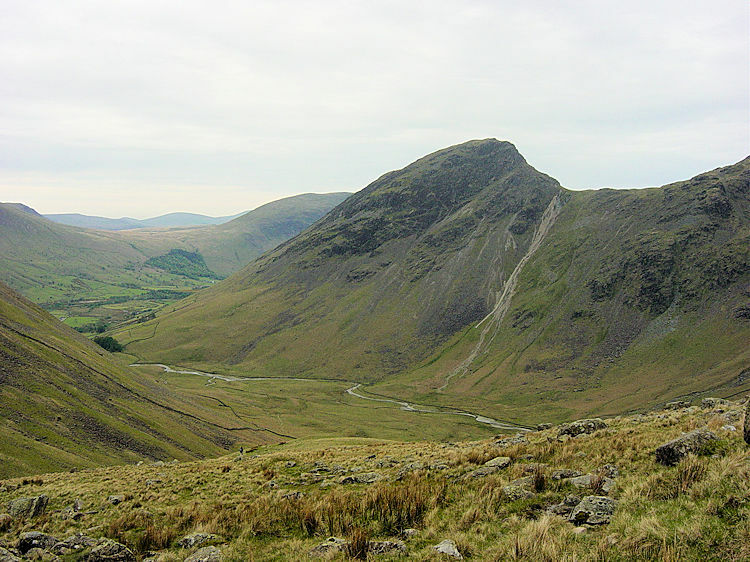 (Note - the statistics and map reflect the crossing of Yewbarrow as this is my recommended option). 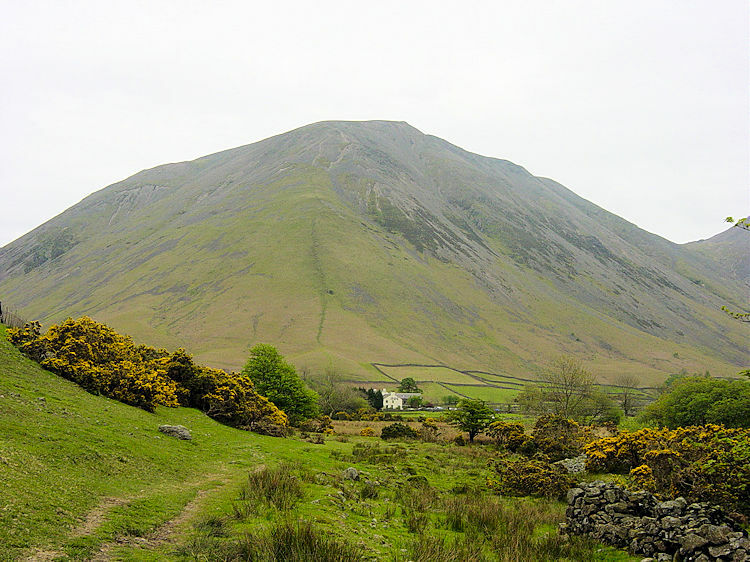 Despite forgoing the final heave up Yewbarrow and the thrilling short scramble on Stirrup Crag which I recall from the last time I still had another couple of highlights to enjoy on the walk. 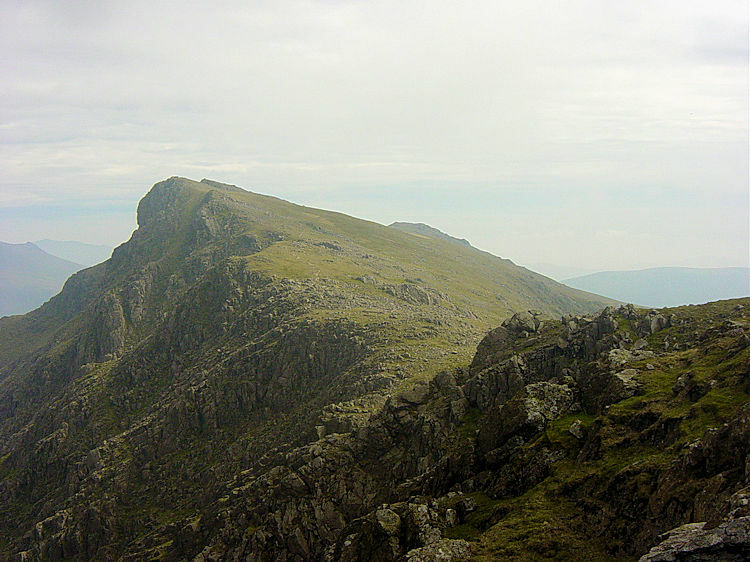 The first was the fantastic view I got of Scafell as it came into view from behind Lingmell at Dore Head. Then after a spooky walk alongside Over Beck I reached Dropping Crag on the south-west face of Yewbarrow which allows for exceptional views of Wasdale. I took the scene in before making the very steep final ascent back to the car park where I found Steve relaxing on the grass verge. We had both had a fantastic walk, mine just a wee bit more wow. The Mosedale Horseshoe rocks!